September 2011: The survey results are in - Soapberry borers are in 42 Texas counties. The soapberry borer (Agrilus prionurus), a native of Mexico, was first reported in Travis County in 2003. Recent confirmed reports have documented attacks of this invasive pest on western soapberry trees in 42 counties in Texas, extending from south Texas to the Oklahoma border (see map). All soapberry trees larger than 2 inches DBH are susceptible to attack. Soapberry trees, the insect’s only known host, tend to die from the top down in 2 to 3 years. Signs and symptoms of attack are bark flakes knocked off by woodpeckers that feed on the larvae, winding beetle galleries evident on the exposed sapwood, white larvae up to an inch long beneath the bark, D-shaped exit holes in the bark, and profuse epicormic branching along the lower trunk. Dr. Donald Grosman (dgrosman@tfs.tamu.edu), Coordinator of the Forest Pest Management Cooperative in Lufkin, has been testing several systemic insecticides for prevention and control of soapberry borer. One of the most promising is emamectin benzoate (EB), recently registered by EPA for a variety of conifer and hardwood pests. EB has proven effective as both a therapeutic and preventative treatment, if the infestation is not too advanced at the time of injection. There is other good news on the soapberry borer front. Although infestations spread rapidly in Texas from 2008-2010, fewer reports of new infestations are being reported in 2011. Indeed, most untreated soapberry trees that Don Grosman has been monitoring as check trees have yet to be infested and infested trees with larvae are difficult to find. Whether this apparent population decline is due to last year’s cold winter temperatures, this summer’s heat and drought, or some unrecognized biological control has yet to be determined. If you observe any active infestations of soapberry borer (western soapberry trees with flaking bark, beetle galleries and white larvae), or if you have noticed a similar decline in activity of this invasive pest in your neck of the woods, please contact Dr. Ron Billings at rbillings@tfs.tamu.edu. We need to determine if this invasive pest is no longer a threat to our native soapberry trees. For more information and photos of soapberry borer infestations, visit www.texasinvasives.org. 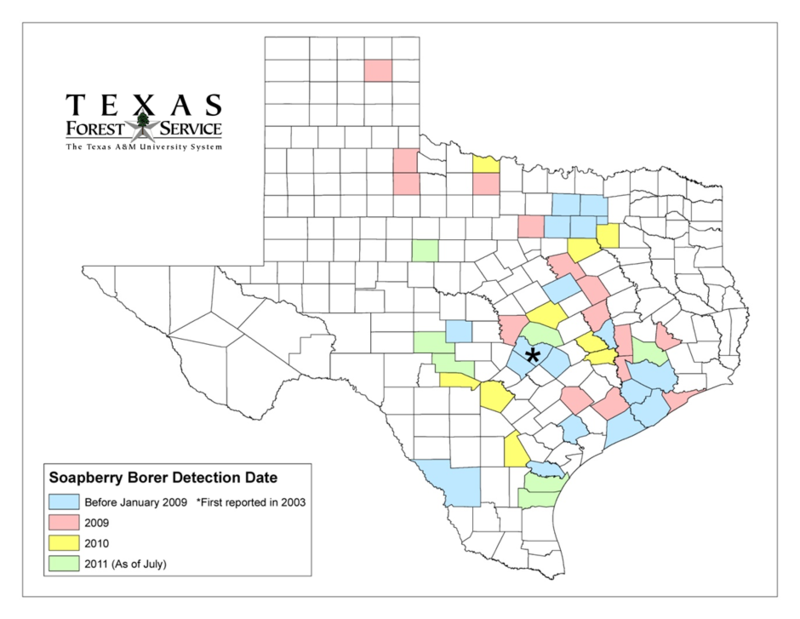 The Texas Forest Service is attempting to determine the current distribution of the soapberry borer in Texas. The soapberry borer, Agrilus prionurus, is an invasive wood- boring beetle recently introduced from Mexico that has been attacking and killing western soapberry trees in various counties of Texas. If you spot dead or dying western soapberry trees, please fill out this form and send it to Dr. Ron Billings at rbillings@tfs.tamu.edu. If possible, attach digital photos of the bark chips, larval galleries, D-shaped exit holes or other signs of attack, together with a close-up photo of the tree's leaves, so he can confirm the identity of the pest. Please follow this link to see descriptions of how to identify western soapberry or the damage this flatheaded wood borer causes. Dr. Ron thanks you for your cooperation.